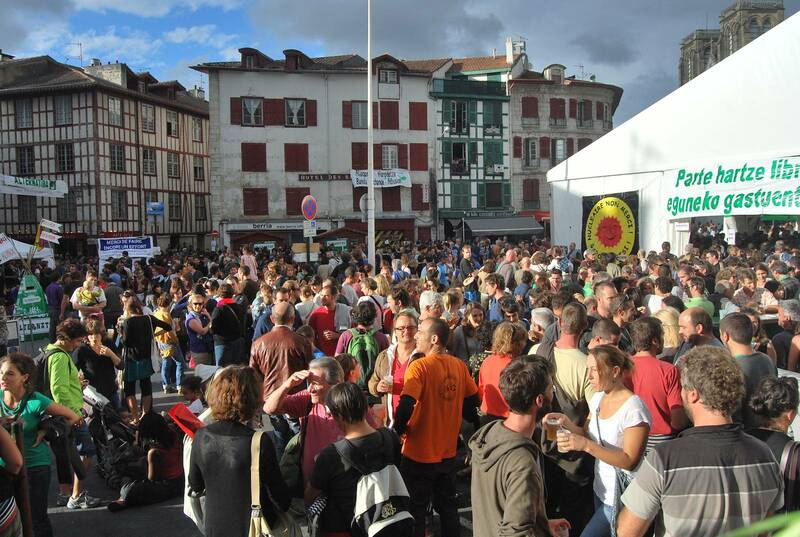 In the wake of the release of the 5th IPCC report 12000 people gathered in Bayonne, France on the 6th of October 2013, to present ways in which climate change can be combatted. This showed that it is indeed possible to raise awareness and interest about the challenges our climate faces, not only with activists, but also the general public. Alternatiba showcases alternatives to climate change and the energy crisis, and which type of concrete means and solutions exist for reducing emissions here and now: smallscale agriculture; relocalisation of the economy; appropriate urban and rural planning; the development of alternatives to the unconstrained expansion of road traffic; frugal energy consumption; environmentally conscious habitation; regulation of financial markets; the ecological and social reconversion of economic production in all sectors; responsible consumption; redistribution of work and wealth; reciprocity; the reduction and recycling of waste; the protection of common goods like water, soil, forests, air, etc. 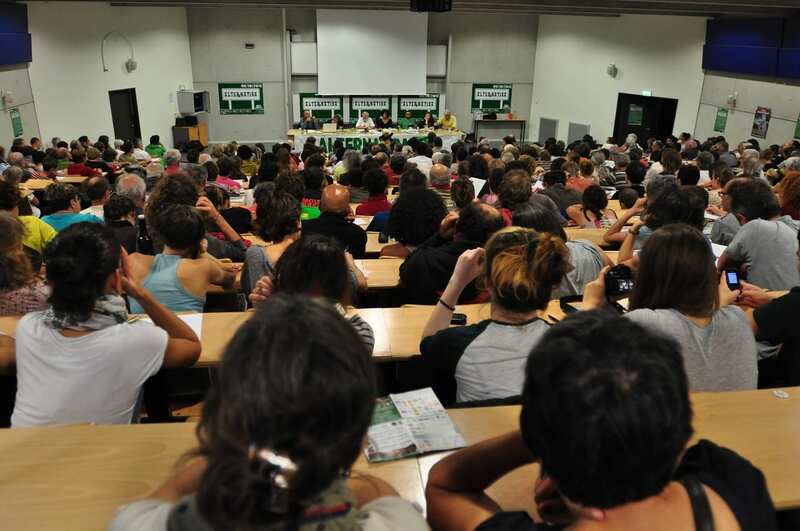 Alternatiba showed that there is a way out the crisis, and that real means exist to build a more solidary, more humane, more equitable, in short a more desirable society. The fight against global warming does not have to be a painful process of adaptation of immense proportions, that exceeds our capacities. Rather, it provides a fantasic incentive, a welcome opportunity and an appealing prospect. It reveals a social horizon, where everyone can find their place. Aside from its quantitative success Altenatiba made a lasting impression on the minds and hearts of the people, and left behind a communal memory of positive energy and shared joy. 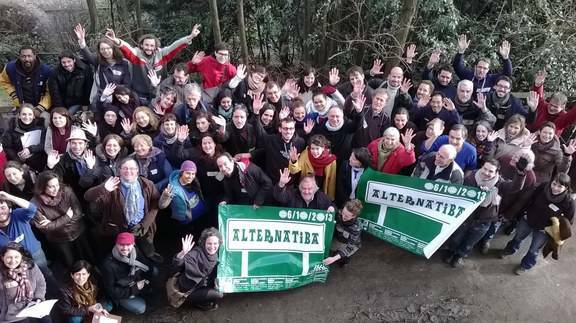 Since the 6th of October over a dozen Alternatiba-Initiatives have spontaneously been launched. Meetings have already taken place in Paris, Bordeaux, Toulouse, Lille, Nantes, Brussels (Belgium), Geneva (Switzerland) and the Polynesian islands. They aim to set up Alternatibas in their cities, some by the end of 2014, other in 2015. Many other initiatives will join them, setting in motion thousands of activists that are fighting for social and environmental justice. 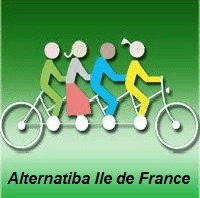 the dissemination of the “Call to create 10, 100, 1000 Alternatibas” in 23 langues européennes. We will work at European level to make sure Alternatiba will not be limited to France but reaches out to Europe and the World. Our aim is to create Alternatibas in as many countries as possible. the dissemination of a 35 minute film with subtitles in various languages about the current climate challenge, the alternatives to climate change as well as the need to act now by creating more Alternatibas. It will be used to introduce public gatherings. 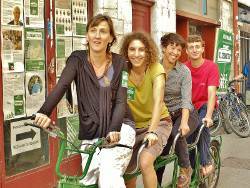 We will organize 120 of these gatherings throughout 2014 and 2015.
the preparation of a tour through France and various European countries with a 4-seater bicycle, the symbol of Alternatiba (it symbolizes solidarity, group effort as well as the ecological and energetic transition). This tour will serve to network and strengthen the various local Alternatiba groups and to proclaim the movement and its message. It will serve to call attention to the various Alternatibas and to the coming COP21. Connecting around 90 different territories, the definite route will be announced in September 2014. Organizing this tour is an opportunity to strengthen the motivation of potential volunteers to organise small or big Alternatiba events on their own and which would be located on the route of the tour. Starting October 2014 the exact stages and places of this 4000 km route will be promoted through a big media campaign. The tour will start on the 5th of June 2015 in Bayonne and finish on the 26th of September 2015 in Paris. The media campaign on the tour is in fact a massive climate mobilisation. 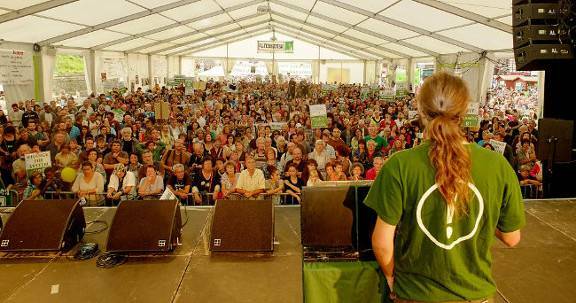 It aims at informing the public on Alternatiba and its message and at putting the spotlight on the grassroots mobilisation around the COP 21. . In a context where anything and everything is sold as solutions to climate change (geo-engineering, agro-fuels, nuclear energy, etc. ), we will insist that genuine solutions are those that promote a social and ecological transition. As for the mobilisation around COP 21 in Paris, we will defend a 100% non-violent strategy. 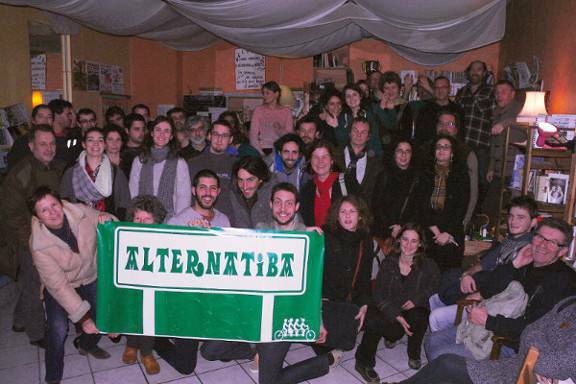 The continued development of Alternatibas between September 2014 and November 2015 represents the second phase of the Alternatiba movement. 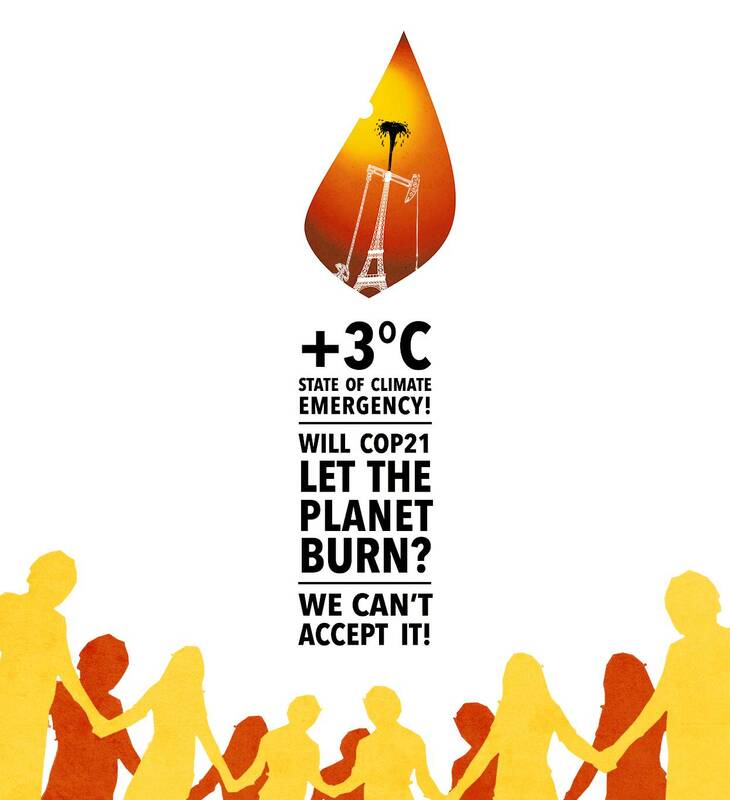 The widespread mobilisation of citizens that will unfold on the occasion of the COP 21 in Paris at the end of 2015, forms the third phase. How exactly it will look, will depend on the thousands of people who join the Europewide movement.